Animal print may seem like a bold choice, often the thought of wearing leopard in particular can be intimidating. The reality is that this is one of the most wearable prints and is best treated as a neutral. Replacing simple black pieces in an outfit with leopard or animal print pieces often elevates the whole look. Yes, it is true that leopard is a print of extremes. It walks the line between luxurious and gaudy and whilst mostly looking expensive and classy, some fabrics can look cheap and the overall aesthetic of a look based around this will be tacky. Not a look anyone aspires to. In order to avoid cheap looking fabric there are two simple tips I follow when shopping the high-street. I seek out natural fabrics (cottons, blends and silks) as these tend to translate better than fabrics with high-stretch or high-shine. Secondly, I look for pieces that are less generic. An item where the print is seamlessly worked into the fabric in an unexpected way, this will appear more expensive. That is why I love the subtle leopard print in this Marks and Spencer’s dress, it reminds me of this standout dress from the Alessandra Rich AW18 collection. If Animal Print really isn’t your thing (if that even exists?). Then you can head over to my other Autumn/Winter trend edits for more style inspiration (Autumn Fashion Trend: Ankle Boots , Autumn Fashion Trend: Women’s Suits). This season the specifics to consider when styling your outfits with animal print comes down to a few key parts. 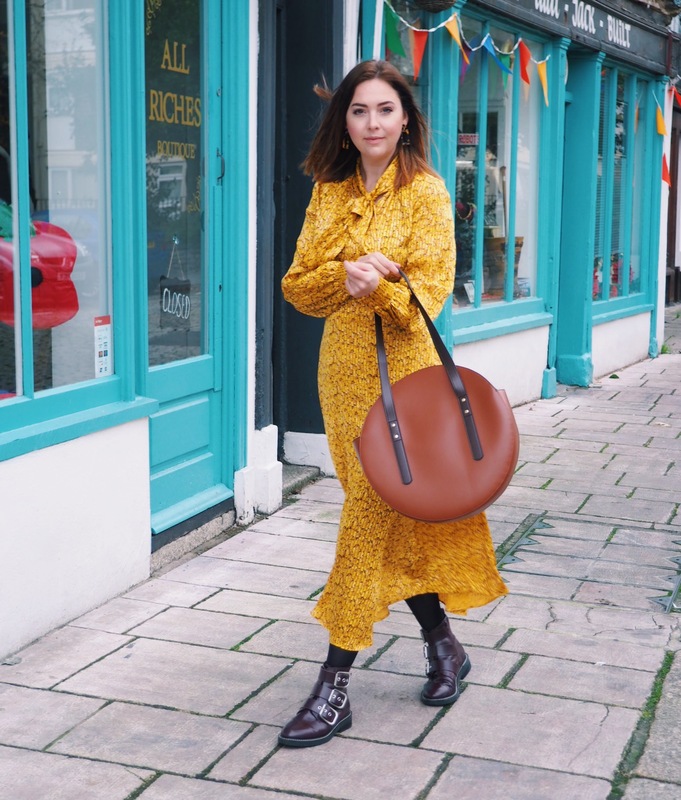 Keep reading for a breakdown of how to wear animal print for AW18 and my most wanted picks from the High-street that you’ll be wearing for seasons to come. Wearing coloured animal prints this season is best done one of two ways (and they are polar opposites). Either the colours should be neutral – think typical caramels, chocolates and other delicious sounding shades. Alternatively, go bold. Extreme brights and vivid shades of red, green, orange or yellow. I for one am delighted to see that Mustard continues the yellow trend and wipes the floor with the millennial pink of ’17 in terms of versatility and wearability. You may feel that the thought of wearing a dress in such a strong print is just too bold or overwhelming to fit with your functional needs or personal style. Small details of animal print can still create a massive impact, think a bag or scarf. Even small accessories such as a beret or gloves can be very chic. Also important this season is how you wear it. The best news for average sized women everywhere?! body-con, tight fitting pieces are done for now. Halle-flipping-lujah. This season its all about loose fitting, flowing, draped or oversized fits. Nipped in in the right places to emphasise your silhouette. Autumn/Winter ’18 is seeing a huge trend that I can only refer to as “Grandad Chic”. It is everything you’d imagine you’d get from raiding Pops’ wardrobe. Think heavy fabrics such as tweed, corduroy with masculine details such as leather buttons or a strong check. The fit will be oversized and the colour palette very typical of Autumn – Browns, Camel, Reds and other earthy shades. Why I am telling you all this, when this is a post about Animal prints? Because, Grandad chic pairs Purrrrfectly (If you thought I was going to write an entire blog about animal print, without going in heavy on the puns,you are sadly mistaken. Puns are roarsome! 😜). Other prints that work well? Winter florals and the the ever-classic stripes. The key is to treat the animal print as a neutral, when worn with unexpected items, the juxtaposition is magical. Leopard on leopard. Leopard and Zebra. Snake and Tiger. Combinations that probably don’t exist too harmoniously when together in the wild, but compliment eachother wonderfully when making a style statement. The key is to pair items with a similar, neutral colour palette. In truth, we all know trends come and go (and come and go, and come and go), but animal print will always have classic style. Popularity of the prints may rise and fall from season to season, but there will always be a place for it in your wardrobe. If you buy the right pieces now, I promise you will be wearing them for years to come – you’ve just got to remember to hold on to them. Do you have a favourite animal print? Whats your favourite way to wear it? let me know in the comments. I have a scarf that I bought in Japan which is half grey camouflage and half grey leopard print. I wear it every year around winter time and it goes with practically all colours and outfits. Firstly, Japan…wow, I would love to visit. Secondly, I love the sound of a leopard/camo combo, so unusual yet I can imagine they really work well together. It’s exciting when your in the early stages of planning a blog. If you are already in the habit of writing regularly then that is a huge advantage. My top tips is to really pay attention to your branding and development – only launch it once you are really happy with those. Once you are live the key is consistent and quality content.